a few years back, i made this little scrapbook using a raw canvas book for my friend's daughter. i'm seeing ryan tomorrow afternoon (she's ever so much taller and all grown up now!) so i thought i'd pull this project from the archives...i love scrapbooking without paper! recently i won a prize drawing on my friend liz's blog, and i was thrilled to get a gorgeous stack of tropical travelogue-themed papers and embellishments from graphic 45.
i made this birthday card for my friend andrea - i accented the lady's collar, headband, and lips with glitter, because, well...have you met andrea? the first item on her bucket list is to swim in a pool of glitter! i just love the vintage images, colors, and patterns in this line! zebra prints, tropical florals, maps, postcards, fish, birds...every sheet is two-sided for lots of options. they also sent me a packet of cute kraft paper flowers. i layered a couple on top of some angelina fibers that i fused into a sheet and trimmed into a feathery leaves. in the center is a cute little dahlia doo-dad from stamping-up. inside i collaged a birthday greeting with elements from a coordinating sticker sheets and added a palm leaf brad and some bronze and pearl blingies. gorgeous papers, can't wait to make more cards with them! congrats to deborah! her name was drawn at random as the winner for my week•1 giveaway. 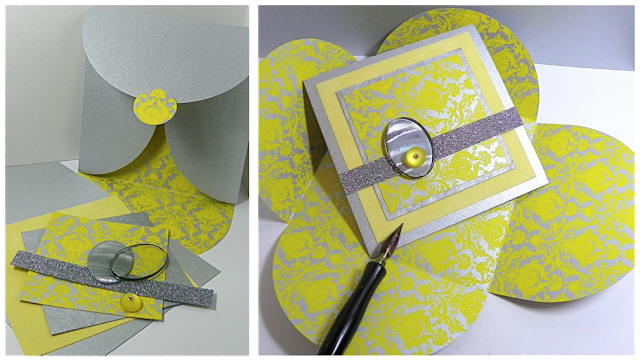 she'll get a kit (shown here) that contains pre-cut papers, embellishments, and envelopes to make three unique greeting cards. i'm making kits to order in my etsy shop. tell me some of your favorite colors and/or themes, and i'll put together a wonderful kit just for you. shown here is an example of a playful floral theme in pastel colors (click to zoom). as promised, my week•2 giveaway is happening right now, right here on my blog (not on facebook). leave a comment here on this post for your chance to win one of my kits in your own favorite colors! deadline to enter is this sunday, 9/30/12. thanks and good luck! i've been itching to work with wool some more (pun intended)...a few years ago i made this cute little sofa pillow for my mom, using a friend's wool sweater that had holes in it. my friend knew better than to toss her husband's old sweater, but she also knew she'd not likely get around to trying needlefelting. so lucky me, i got the sweater! i cut off the sleeves, neck, and bottom band...all just straight across, leaving the largest piece from the middle of the sweater in tact with its side seams; it was like a large tube. i needlefelted my pattern on to one side, stuffed it, and stitched it up on the top and bottom edges. if you haven't tried needlefelting before, click here to watch one of my tutorials. i'm super excited to announce my brand new cardmaking kits that will be available for sale on my newly dusted-off etsy in just another week or so...go tell mama!! 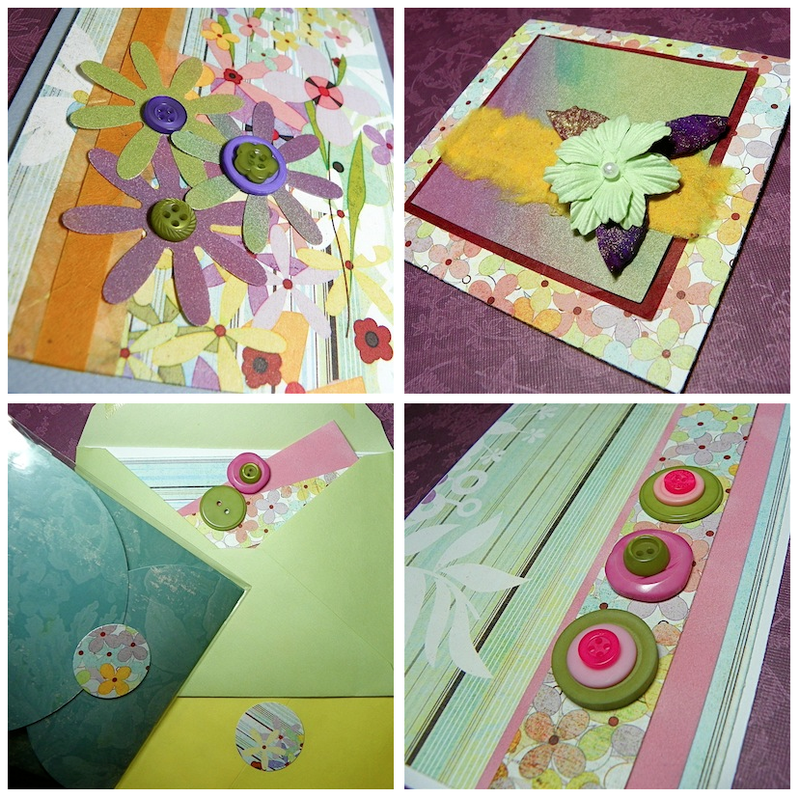 to celebrate, i'm giving away 6 cardmaking kits, one per week. click here to enter this week's giveaway on my facebook page! each kit comes with gorgeous pre-trimmed papers and sweet little embellies to make 3 different greeting cards, each with its own matching envelope. a how-to sheet is included with instructions for easy-peasy assembly...all you need are your favorite adhesives (i include recommendations) and you'll be whipping up beautiful handmade cards in just a matter of minutes! i'm creating simple yet sophisticated card designs, using really pretty art papers with yummy fun scrapbook papers and lovely textured papers...so you'll have something truly unique, for no more than you'd pay for most store-bought cards. 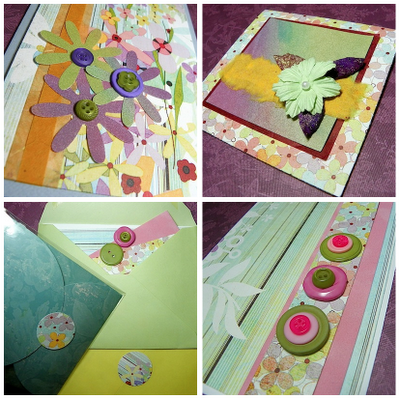 don't just send a card, create a keepsake! if you aren't on facebook, never fear, i'll post 3 of the 6 giveaways just here on the blog, alternating with the facebook giveaways. this week's giveaway runs until 9/23 - click here to enter and good luck! a couple years ago, i made this journal cover for a challenge, using random scraps of fabric. super quick and easy...i love to dump my scrap basket out on the table, dig through for some pieces that might look fun collaged together, and then do a little improvisational stitching! i bought an unfinished wood letter holder probably two years ago from the walnut hollow site on clearance. it has been sitting in its plain state on my desk, holding assorted papers and stamps and such. i finally decided to paint it with a leftover cupful of pretty lavender paint that my cousin had blended the other day while crafting with me. i used mod podge to adhere a strip of floral basic grey paper (the kioshi collection) to the front and to embellish the sides with purple glitter. then i trimmed the top edges with a krylon gold leafing pen. i finished it off with gold adhesive gems, and a gold flower button that's glued to an alcohol-inked podgeable acrylic circle. it's just so much cuter now! autumn is right around the corner...and i can't wait for those cool and crisp fall breezes. i made this fiber art piece by painting spunbond with my favorite acrylic inks. i painted strips of different colors in criss-cross layers with a little water and a wide brush to create abstract window panes. spunbond is a non-woven fabric that is commonly used for coveralls, surgical masks, and lots of other disposable or filtration products. it's not easy to find just in sheets or on bolts, but a small sheet comes inside this fiber art kit, or you could deconstruct something made from it. spunbond is easy to stitch and glue, but it can be a bit unpredictable as inks soak into it. it's somewhat moisture-resistant, so some areas will grab the color more than other areas. but i don't mind, i just love the pin-hole texture! the leaf embellishment is a printed piece of lutradur on top of an inked piece of bamboo blend batting. i was beyond thrilled to learn that my piece has been featured in five different autumn-themed etsy treasuries. there's so much beautiful handmade inspiration to see here—have a look (and a listen)! this card turned out a little too busy, but i still like it. i was trying to reflect a little feeling from the regal theaters in the silent film era. i cut up a collage sheet filled with tiny pics of these beautiful vintage ladies and used gloss mod podge to adhere them to the back of each filmstrip. i blinged it up a bit with these wonderful gold buttons and a glittered scallop trim.